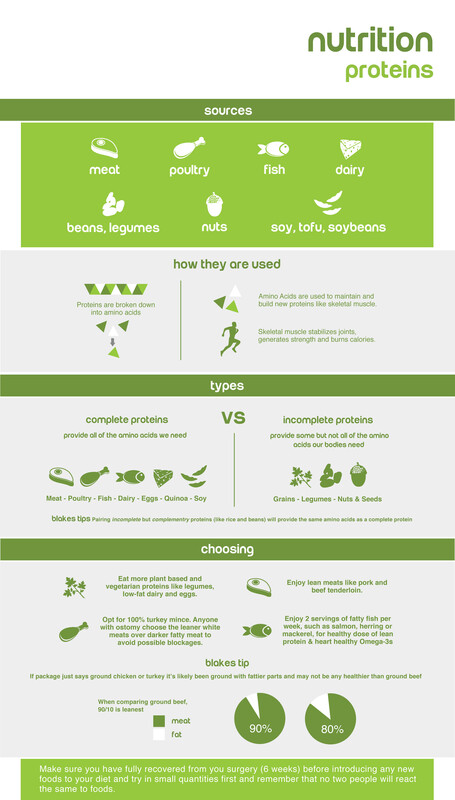 The word ‘protein’ refers to a type of molecule in food that can be broken down into amino acids. The body needs twenty amino acids – as a biological machine it can create (or synthesize) eleven of these itself. However there are nine, called ‘essential amino acids’ that the body cannot create and has to gain through the consumption of food. Although most foods contain protein some foods are richer in some of the essential amino acids than others. Usually, therefore, foods need to be combined so that the body receives all the amino acids it needs on a daily basis – part of the reason that a varied, balanced diet is essential to us. For example, if you ate only blueberries you may start to lack the Tryptophan, Lysine and Histidine that your body needs – introducing some meat and/or cheese into your diet would help to address these deficiencies. Protein is the body’s building block. All of our organs, including the skin, are built from proteins, as are the muscles, hair and nails. Many hormones are proteins, and, the immune system, digestive system and blood all rely on proteins to work correctly. Protein is therefore an essential part of our diet, vital to development and correct functioning of the body. Protein is particularly important for children and adolescents – as they grow and develop into adults proteins are used to produce tissue. Most people view carbohydrates as “bad” foods. Found in breads, pastas, cereals, and almost everything sweet, carbohydrates receive a bad reputation for causing weight gain. In reality, carbohydrates provide energy your body needs to help you function throughout the day. They are the fuel that keeps your body moving, similar to the way petrol functions for a car. Scientifically, carbohydrates are organic compounds that contain a saccharide (sugars). some people describe it as carbohydrates are foods that your body uses to make glucose. Specifically, amylase (an enzyme in your body) breaks down the carbohydrates you eat to produce glucose, giving you energy. Glucose can be used right away (as seen in diabetics or long distance runners), or your body may store it for use later. 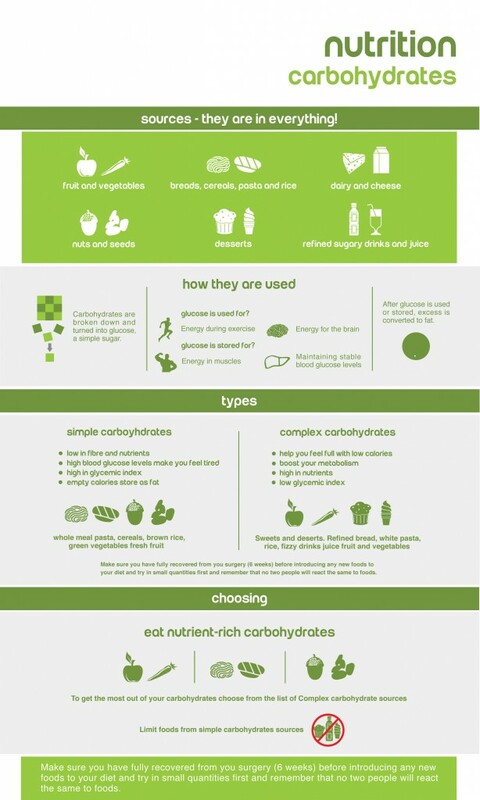 There are 2 different types of carbohydrates: simple and complex. Simple carbohydrates are typically digested and absorbed faster in the body. They are more commonly known as sugars and are found naturally in fruit, vegetables and milk products. You will also see simple carbohydrates in processed foods. Added sugars should be limited in the diet; naturally occurring sugars, such as those found in fresh fruit and milk, contain vitamins and minerals that are useful to your body. Complex carbohydrates include starches and fibre. They must first be digested before being used as energy. Foods high in starch include vegetables (peas, corn, and potatoes), beans and lentils, white bread, white rice and crackers. Fibre is also found in most of these foods; it is the part of the plant that is not digested by the body. Other examples of fibre rich foods include whole wheat bread, oatmeal, whole grain cereals, fruit, and brown rice. Incorporating more of these foods into your diet will help provide you with energy, while helping you limit your portions, since it keeps you feeling fuller longer. * MORE SCIENCE: The Calories you see on food labels are actually kilocalories, and are also called food calories. One kilocalorie is equal to 1,000 calories. This is why food calories are listed as “Calories” with a capital C. One Calorie equal 4,184 joules of energy. You need energy to survive – to breathe, move, pump blood and more! Your body gets this energy from food. The number of calories in a food item is a measure of how much potential energy that food has. Foods are a combination of these three building blocks. So if you know how many carbohydrates, fats and proteins are in a food, you can figure out how many calories, or how much energy, that food contains.